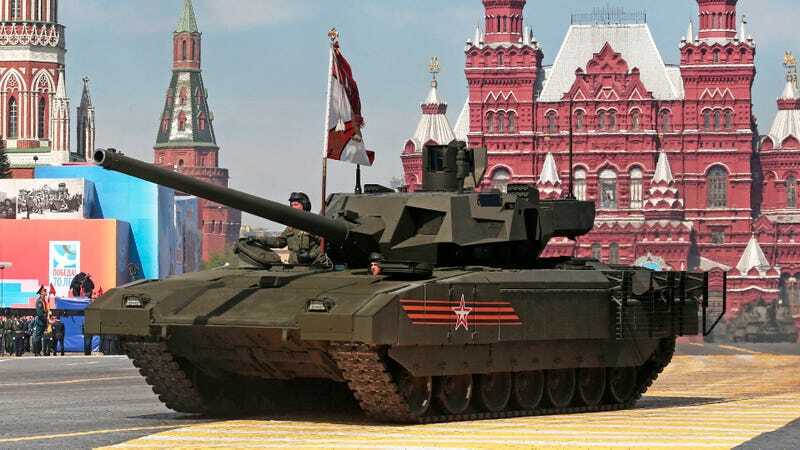 Some 200 military ground vehicles, 140 aircraft and 16,500 troops participated in the 70th anniversary of Victory Day parade held in Moscow’s Red Square today. Highlights included Russia’s new “Armata” family of armor and China’s President Xi Jinping standing alongside Putin for the whole affair. As far as displays of military might go, Victory Day ‘15, which commemorates Russia’s victory in the Great Patriotic War, also known as WWII, didn’t disappoint. In fact, it totally dwarfed other events held in the US and Europe. Here in the US, President Obama didn’t attend a 70th Anniversary of VE Day ceremony, deciding to talk about free-trade at the Nike Campus in Oregon instead. Meanwhile, on the Capital Mall, a large flyover did occur, dubbed “Arsenal Of Democracy,” but instead of America’s latest and greatest military gear, the Warbird community provided 70 aircraft for review. Back in Moscow, the mood seemed a little more reserved than Victory Day 2014, as Russia was in then in the process of geopolitically mutating before the world’s eyes after its shock invasion of Crimea. Still, the fact that China’s highest official flanked Putin for the whole affair, while no Western European high ranking officials were present, provided interesting visuals and a possible hint as to what is to come on the world stage. There was even a slight swipe at the US in Putin’s speech, where he stated “in the past decades, we have seen attempts to create a unipolar world.” Such a statement undoubtedly played just as well for his Chinese guests as it did for the hometown crowd. Taking all this into account, along with the striking visuals of the day, it seems like a new Cold War is alive and well, even if the West is in denial of it.